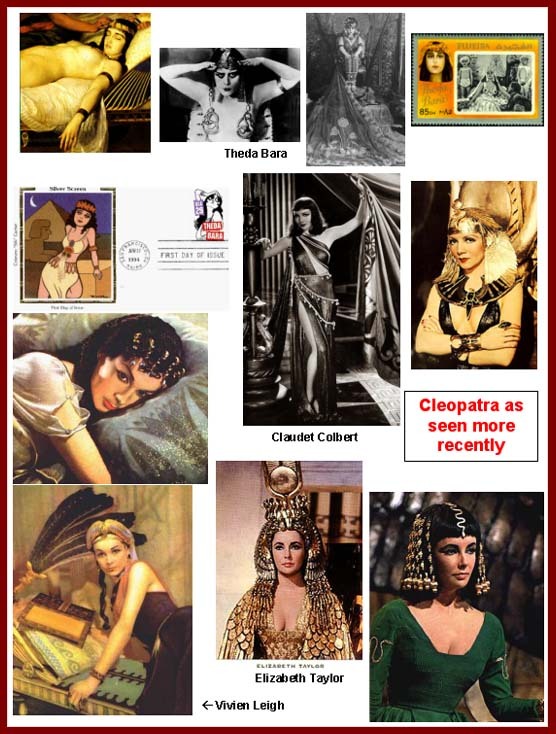 Click on small images or links below to see larger images. Use the "return" or "back" button on your web browser to return to this page. society (of which he was an active participant). His poems are available on the Internet in many languages. 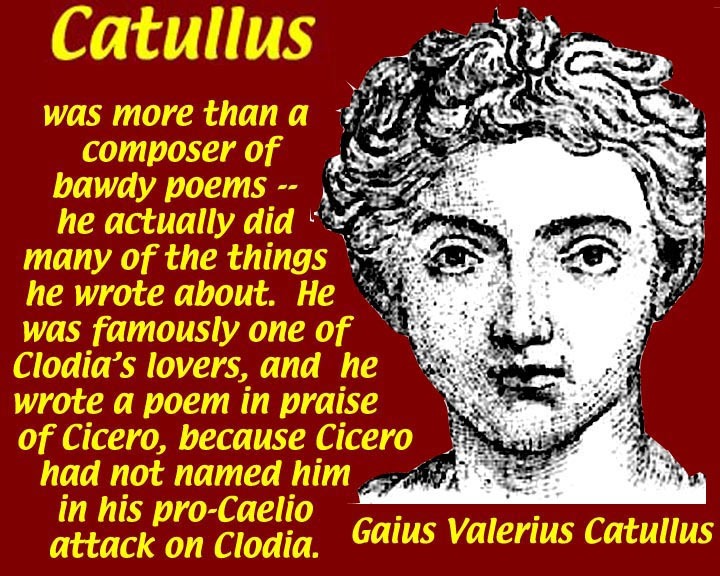 http://rudy.negenborn.net/catullus is a good place to start. A few questions to think about. A brief and not inclusive chronology of the period covered by this unit. 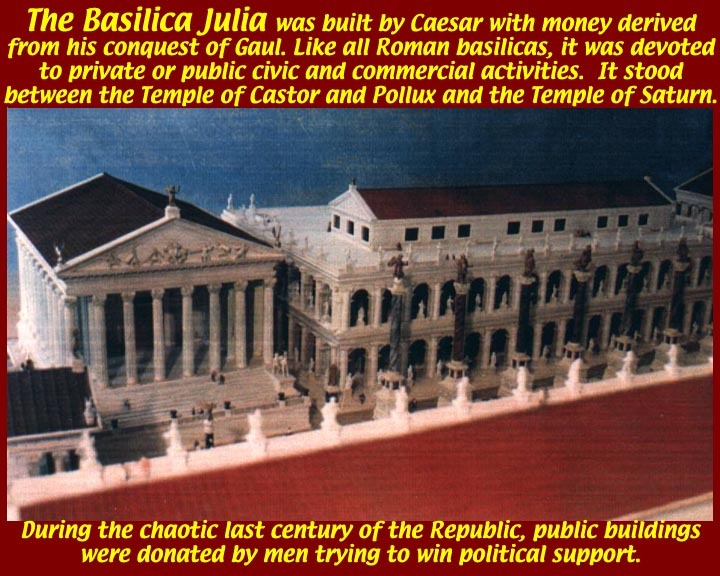 to advance their political goals, they used the parts of the Roman army to take over the city. 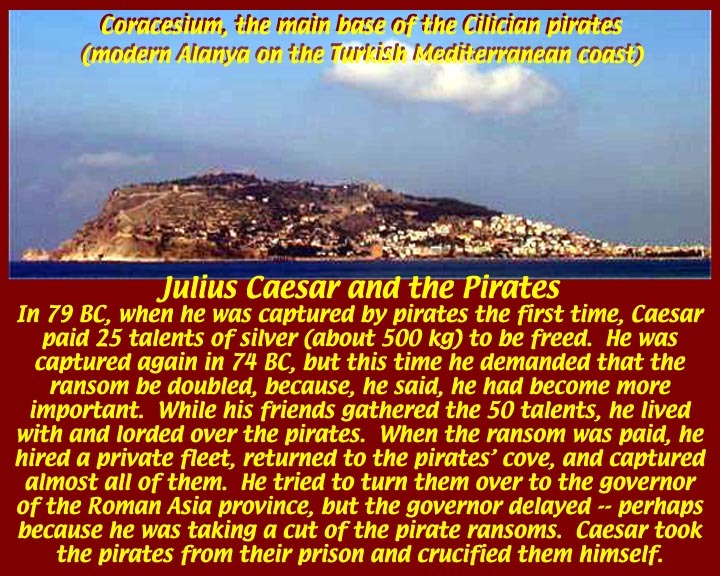 An episode in the life: Caesar was captured by pirates for the second time in 74 BC when he was 26 years old. While waiting for the ransom to be paid, he bragged to the pirates that he would return to kill them all. 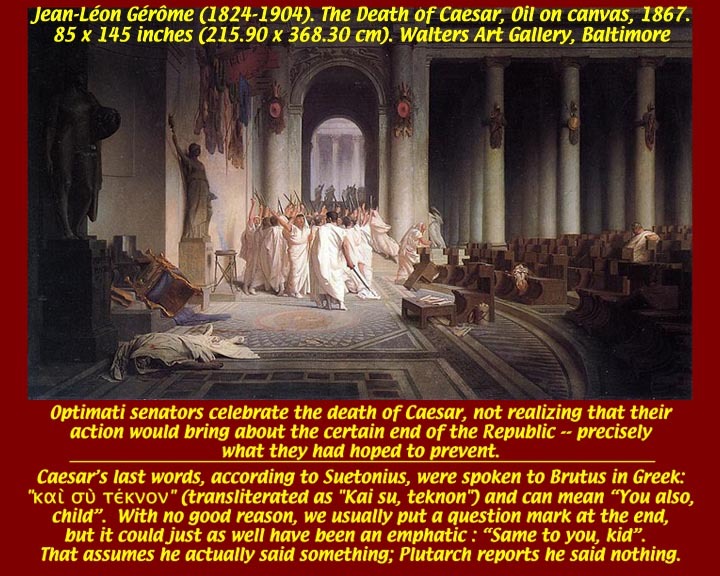 When released, he told the Roman governor exactly where the pirates were, but the governor (probably in cahoots with the pirates) ignored Caesar's information. So Caesar hired his own fleet, attacked the pirate base, and crucified his former captors. Very flashy for a young man. But the pirate problem was endemic, and Caesar's nick in the side of the operation didn't slow it down. 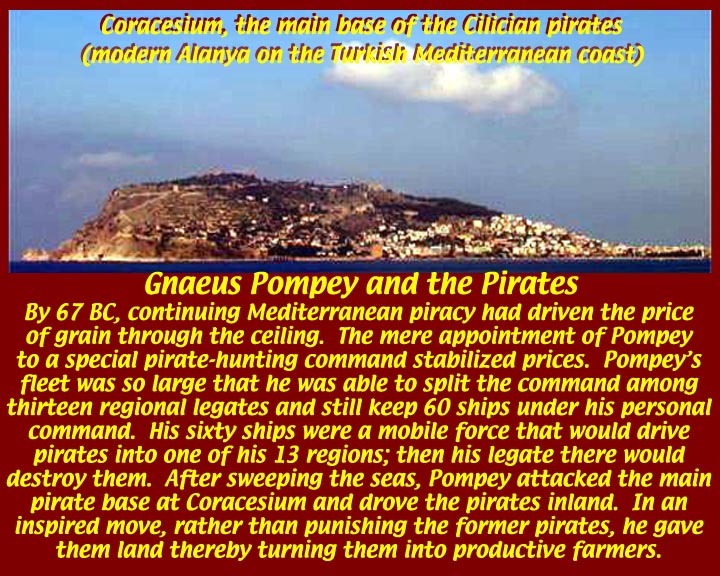 General (and Admiral) Gnaeus Pompey was given the resources to wipe out all piracy, and he accomplished it handily -- after defeating the pirates and wiping out their main base, he gave the survivors land (inland) and turned them into farmers. Con man or great politician? Wait -- who said there was a difference? There certainly wasn't a difference in those days. 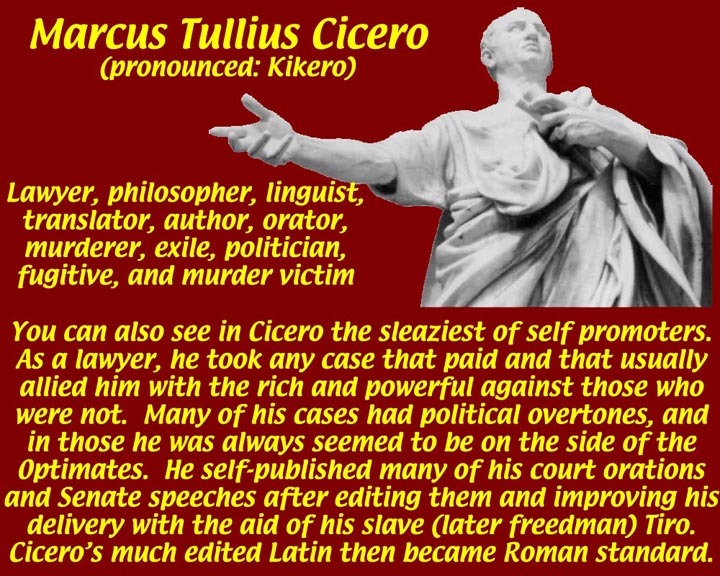 Cicero used every devious trick he could find to work his way to the top. Throughout most of his career, he managed to balance powerful men and powerful factions. He finally found himself backed into a corner where he thought he had to choose between Augustus and Mark Antony. 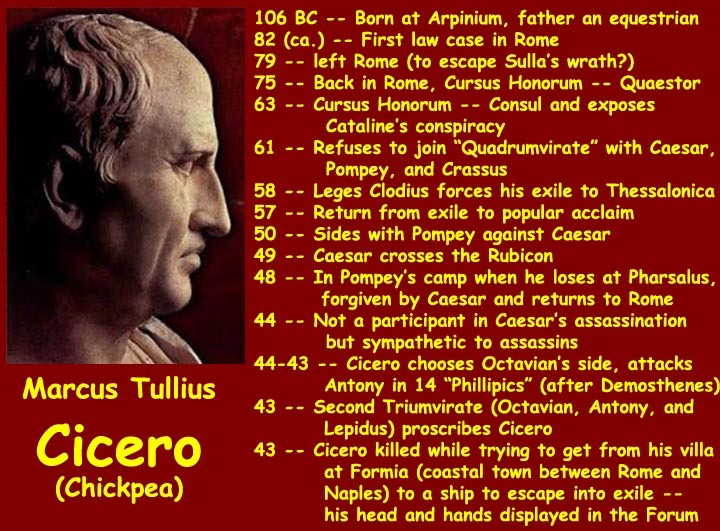 He chose Augustus and attacked Antony in a series of "Philippic" speeches, the fatal results of which occurred shortly after the period now being covered. 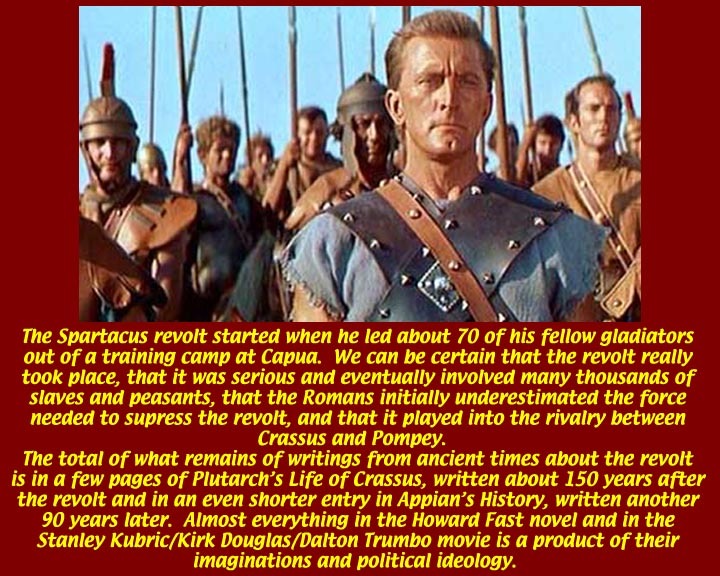 Ben Hur -- an ideological book and movie(s) based on few known facts. What we do know is that the results of Ben Hur's defeat fed into the rivalry between Pompey and Crassus. 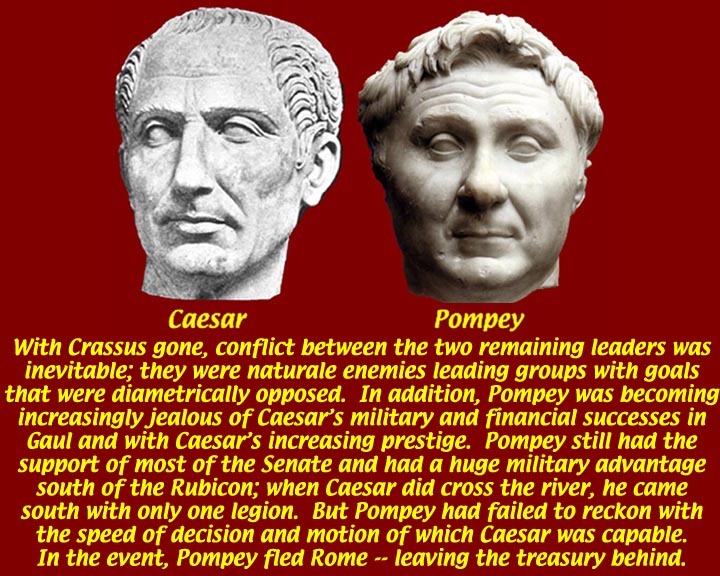 Pompey and Crassus were both great generals, and they represented different strata in Roman society. 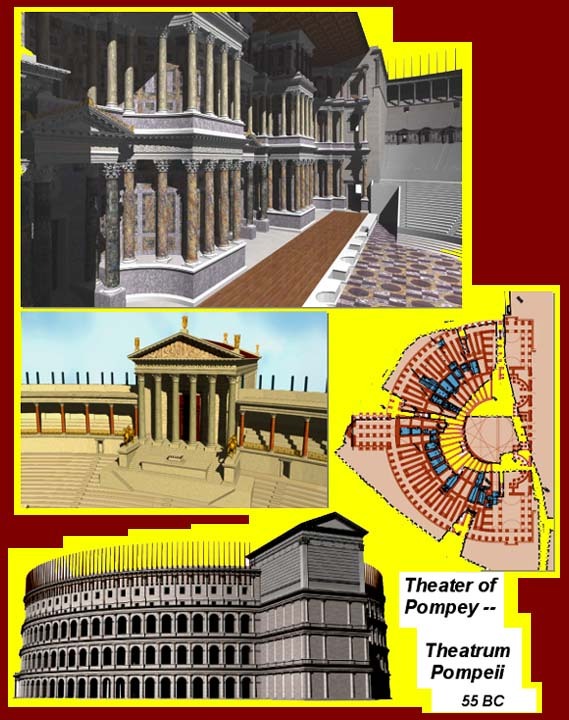 Pompey's extremely rich father from Picenum had climbed through the Roman cursus honorum to Consul, and so Pompey was "second generation"-- and very proud to be among the Optimati. 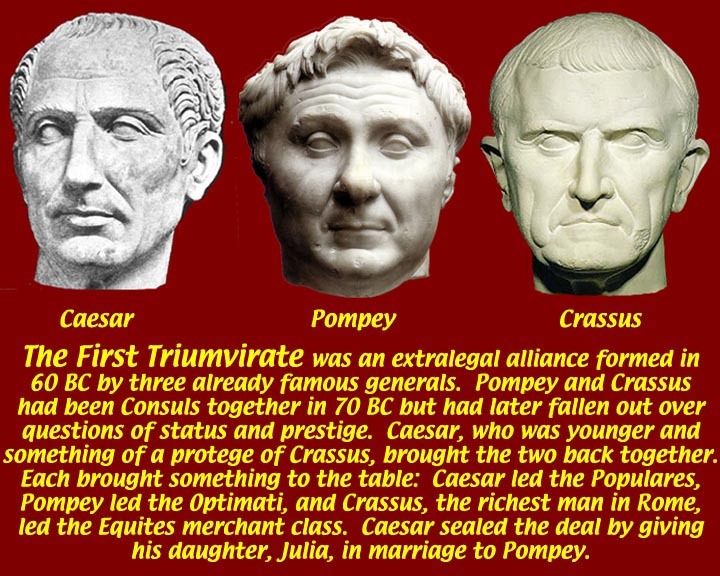 Crassus was from a much older Roman line, but the family had lost most of its wealth due to proscriptions during the times of Marius and Cinna. He recouped the family fortune by acquiring the landed estates of those proscribed by Sulla. His minions also pretty much controlled the market for POW slaves, and he owned very productive silver mines. 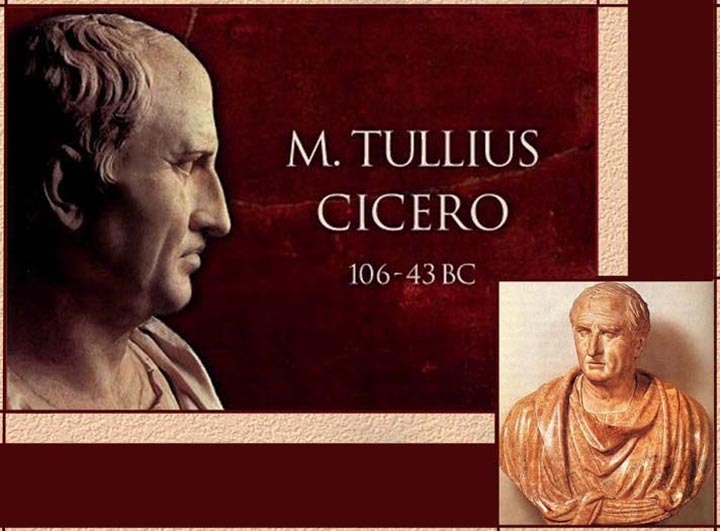 He soon became the the richest man in Rome, and is still considered to be one of the ten richest men in history. He was also very big in the informal loan business (but not a banker -- that would be below his class.) Among those in heavy debt to Crassus was young Julius Caesar. With all his money, it's not surprising Crassus successfully wooed the merchant equestrian class. 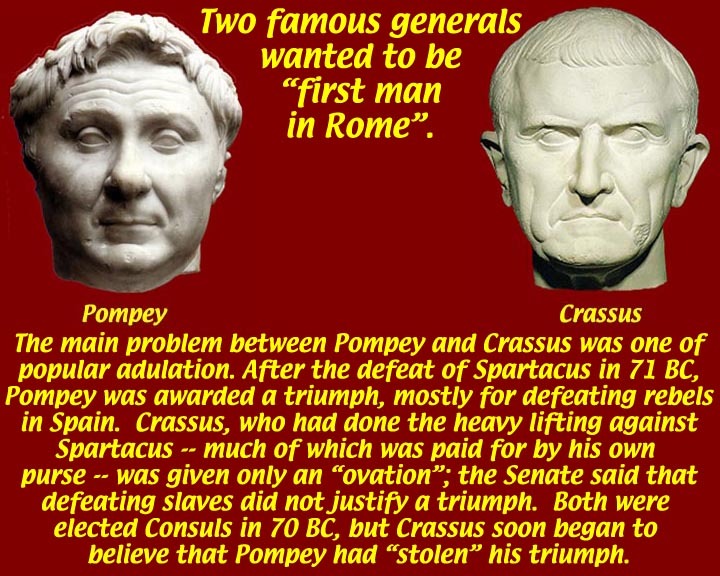 The only thing that Crassus lacked was a formal military Triumph, and he thought that Pompey had usurped a Triumph that Crassus had earned for defeating Spartacus. 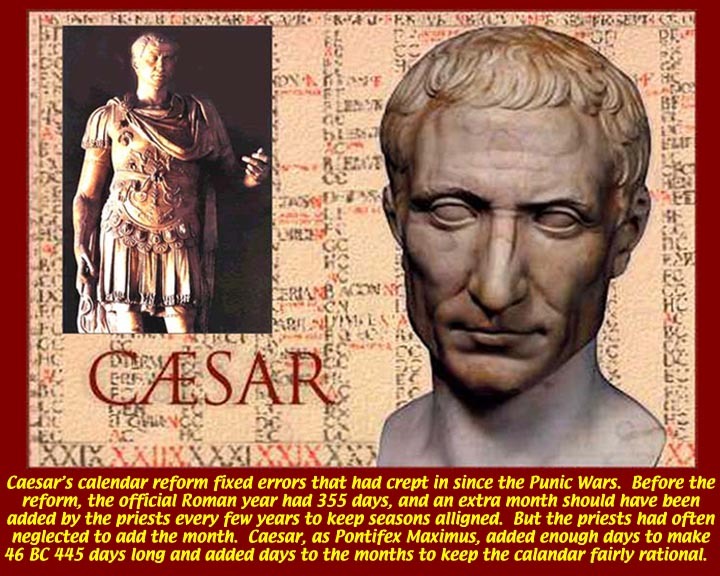 Caesar, in his capacity as Pontifex Maximus, corrected and regularized the Roman calendar. 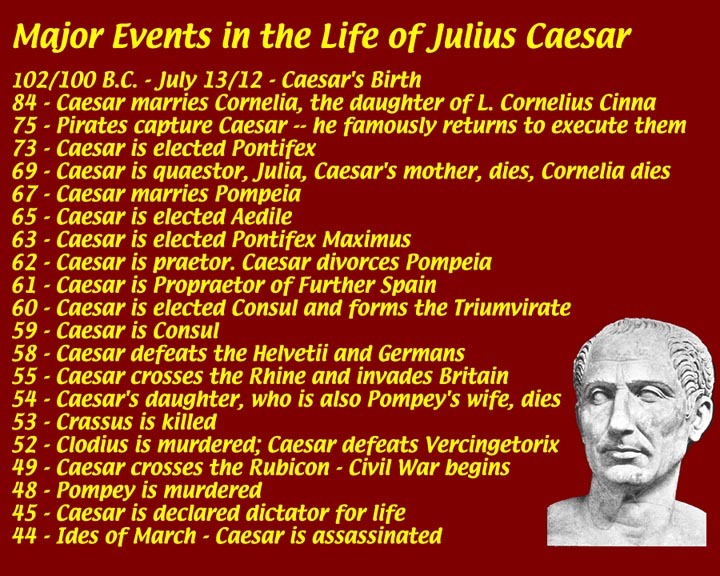 His "Julian" calendar has now been largely replaced by the Gregorian calendar. See, on the Internet, http://en.wikipedia.org/wiki/Julian_calendar. 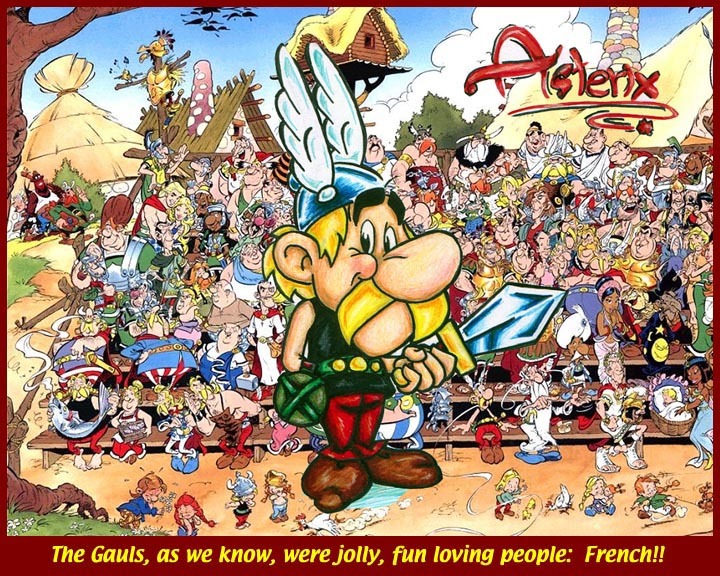 The Gauls conquered by Caesar would certainly have wished for the Druid potion that allowed Asterix to routinely defeat the Romans. It must mean something that, at least in comic books, the Gauls were smarter than the Romans, n'est-ce pas? 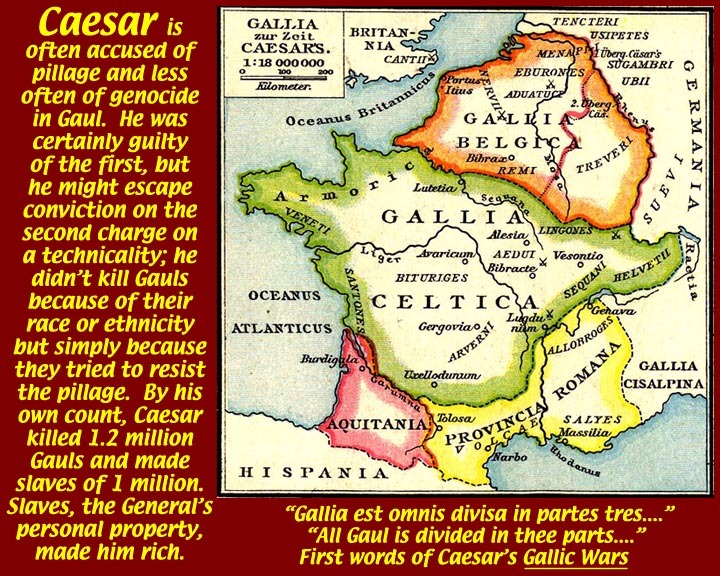 A major part of Caesar's self-promotion effort was his Commentarii de Bello Gallico (Commentaries About the Gallic War), which famously started by defining the three parts of "all of Gaul". 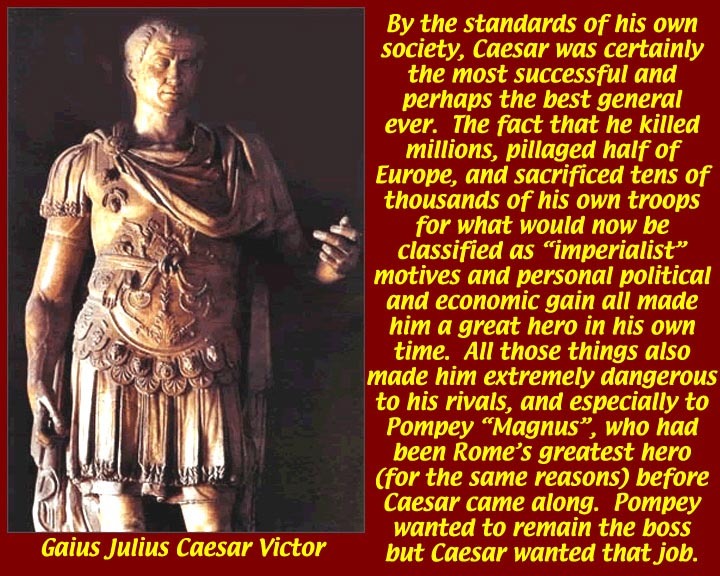 Caesar ensured that his victories and his accumulation of wealth were well known among his supporters back in Rome. 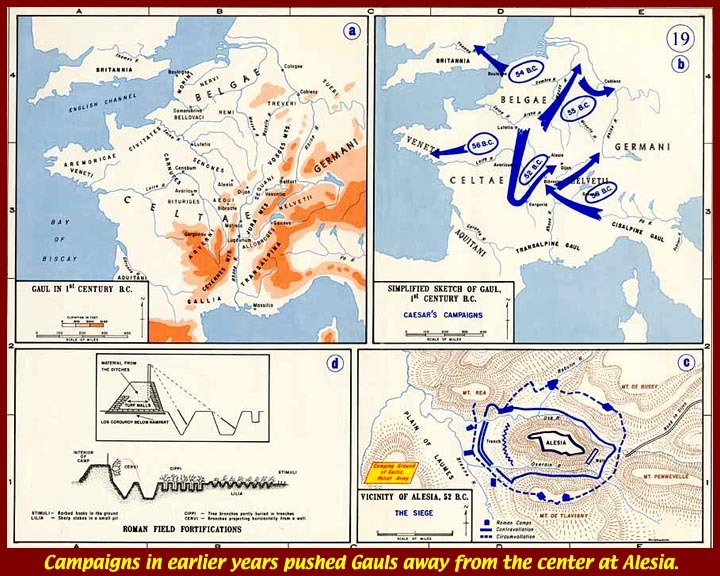 Caesar's methodical strategy was to push the barbarians out to the edges of Gaul before attacking the center. 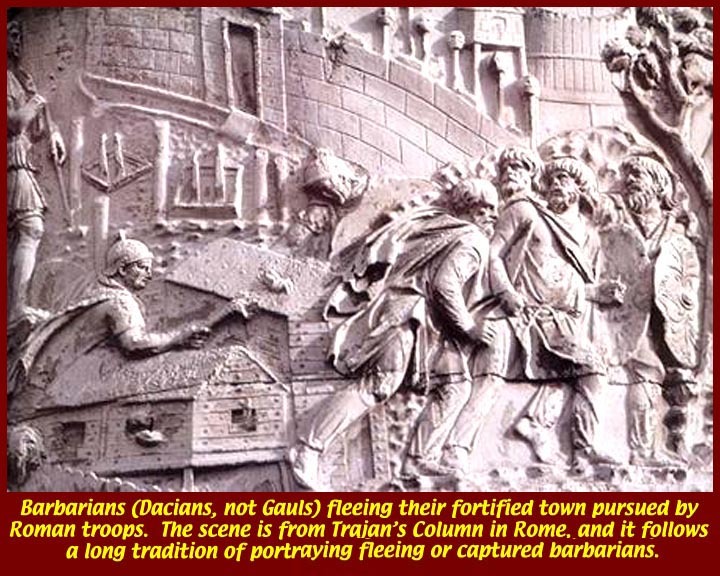 Not really Gauls, these are actually Dacians being chased by Trajan. 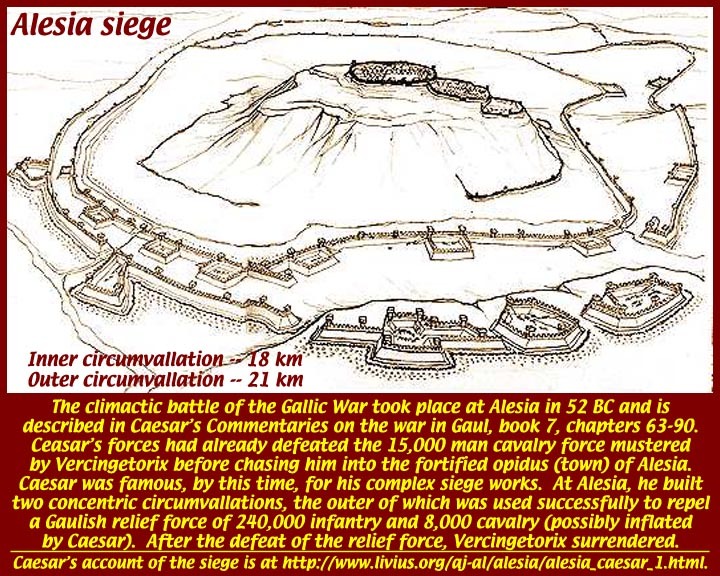 The climax of the Gallic War was the siege and capture of Alesia. 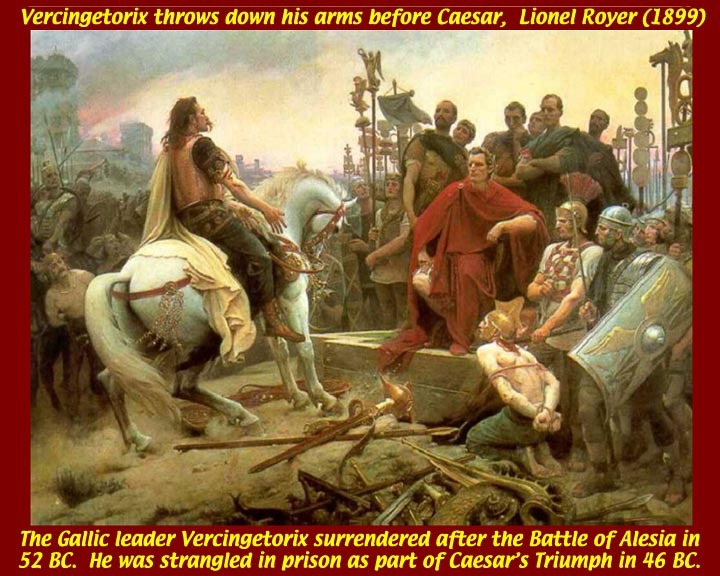 At the end, the Gauls had united under Vecingetorix. 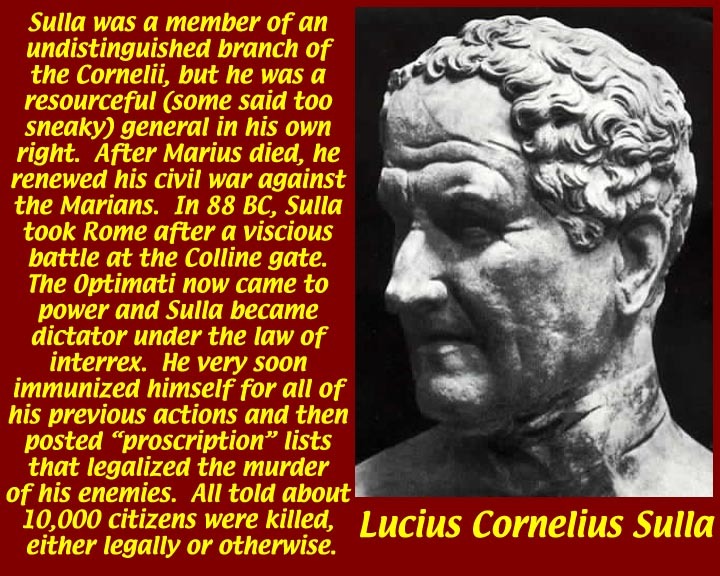 After seeing that his reinforcements had been defeated, he finally surrendered to Caesar in 52 BC and was taken back to Rome where he was executed in 46 BC. While the Gallic War was still in progress the cords that bound together the First Triumvirate frayed and then snapped. 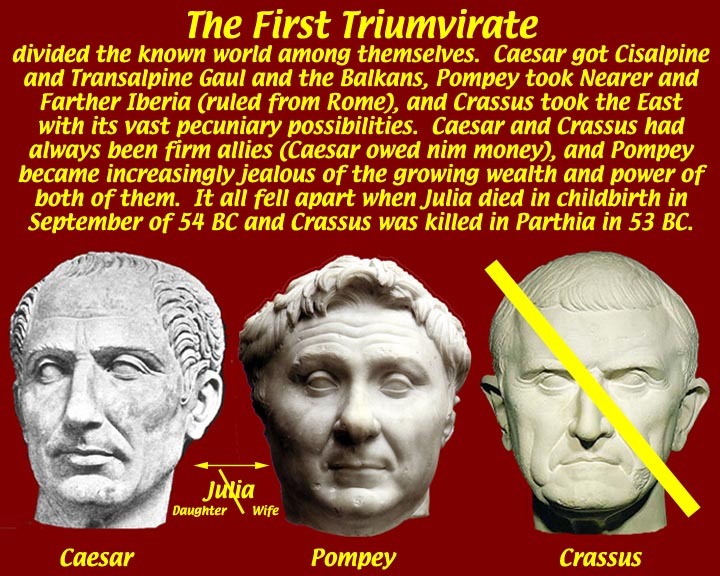 Caesar's daughter, Julia, who he had married to Pompey, died in childbirth, and Crassus was killed in Bithynia while, yet again, pursuing his Triumph. 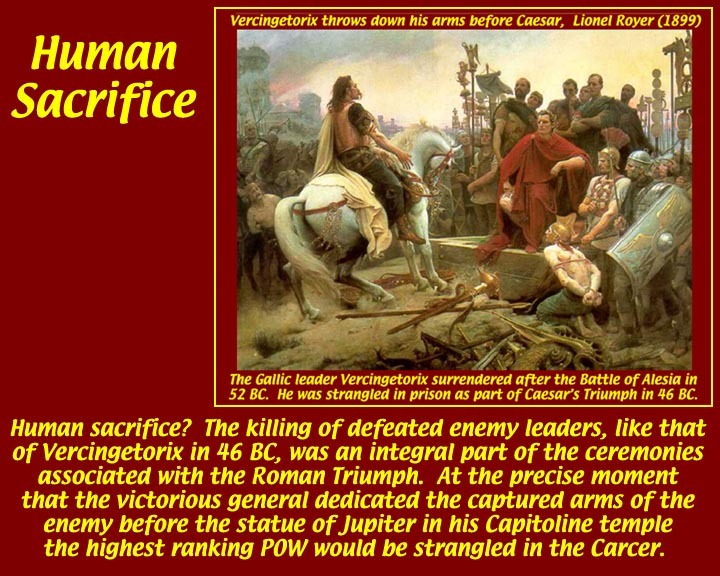 A hero in his own time, Caesar wouldn't get much respect today -- even as a "great general". His casualty and expenditure rates were just too high. And even though his wars eventually made him rich, he either kept the money for himself and his heirs or used it to buy power in Rome. 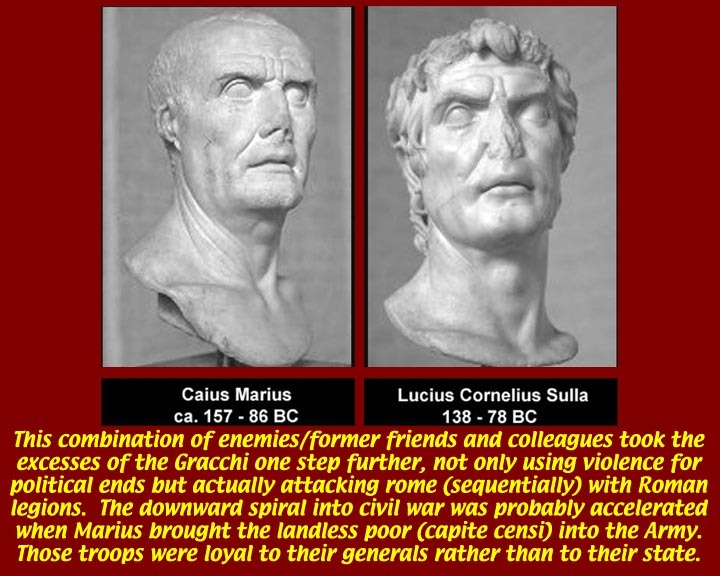 Rome, before and during the Caesar-Pompey Civil War had sunk into gang warfare -- and the two leaders both condoned and inspired most of it. Clodius was a surrogate for Caesar and Milo was Pompey's man. 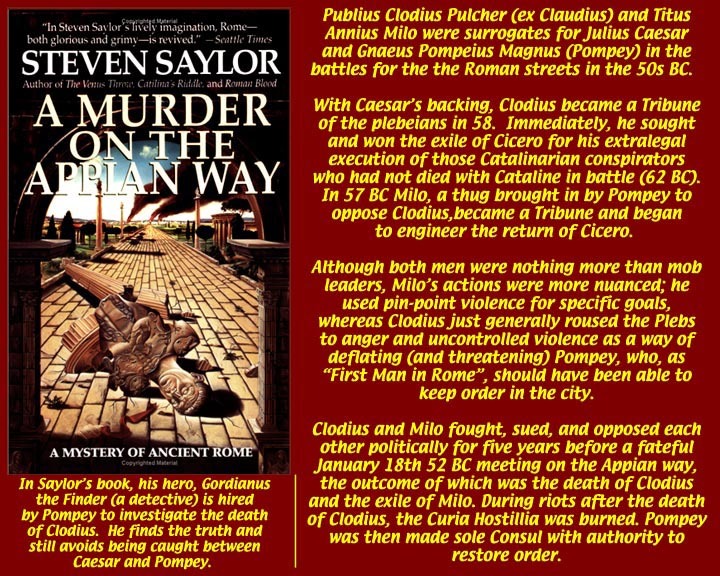 When push came to shove came to death for Clodius on the Appian Way, the Populares rioted in the Forum. 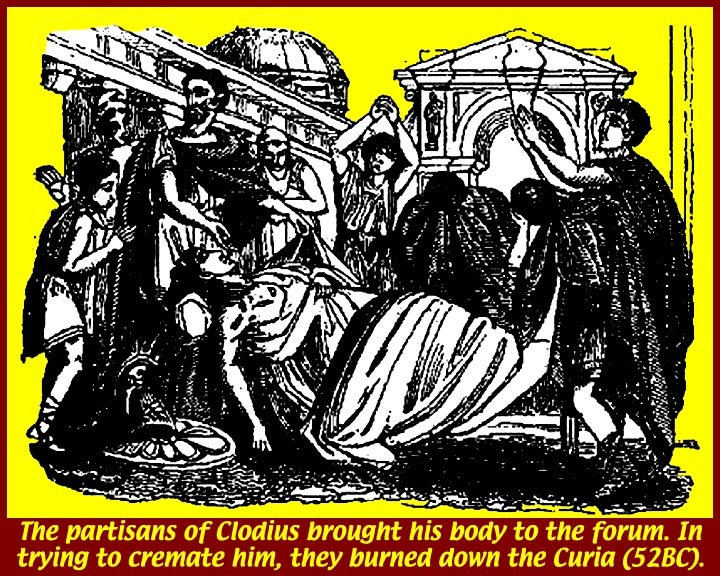 The pyre they built for Clodius was too close to the Curia Hostilia -- or perhaps it was burned intentionally as a symbol of Optimati Senatorial power, depending on who you believe. 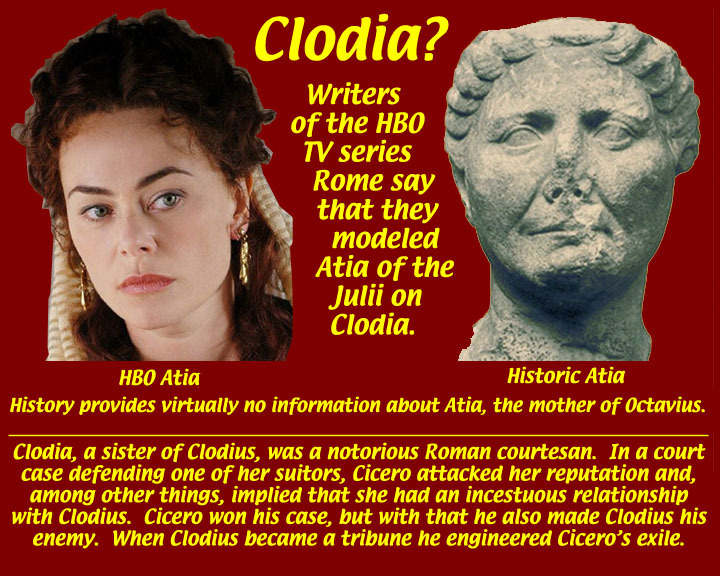 In the HBO TV Rome series, "Atia of the Julii" is modeled on Clodia, the notorious sister of the Populares mob leader, Clodius. 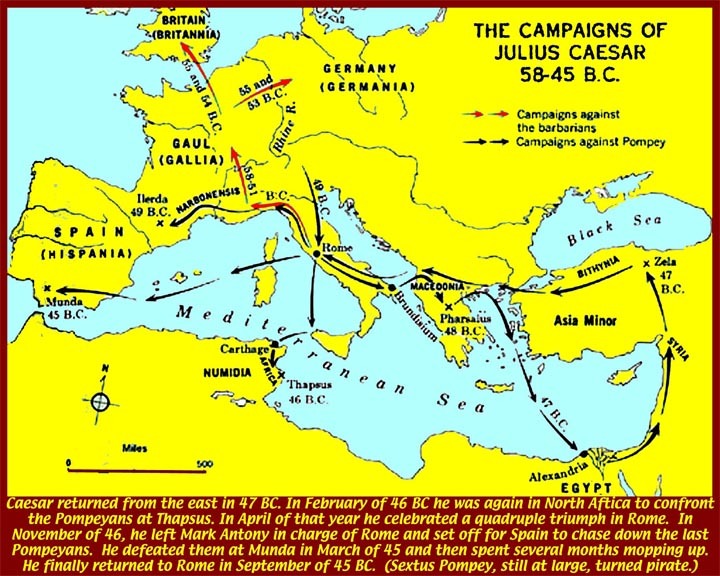 In 49 BC Caesar had finished off the Gallic resistance and camped north of the Rubicon with one legion. His other legions were still north and west of the Alps. trap, had his allies among the Tribunes intervene on his behalf. 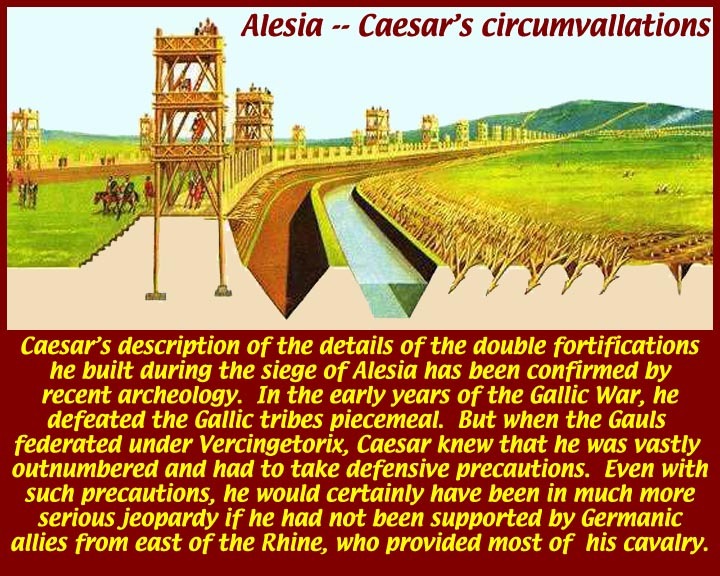 When the Tribunes' pleas were rejected and they had to flee Rome, Caesar had both an excuse to cross the Rubicon and a way to get his troops to come with him across the Rubicon, a small stream that marked the line between "Rome" and Cisalpine Gaul. 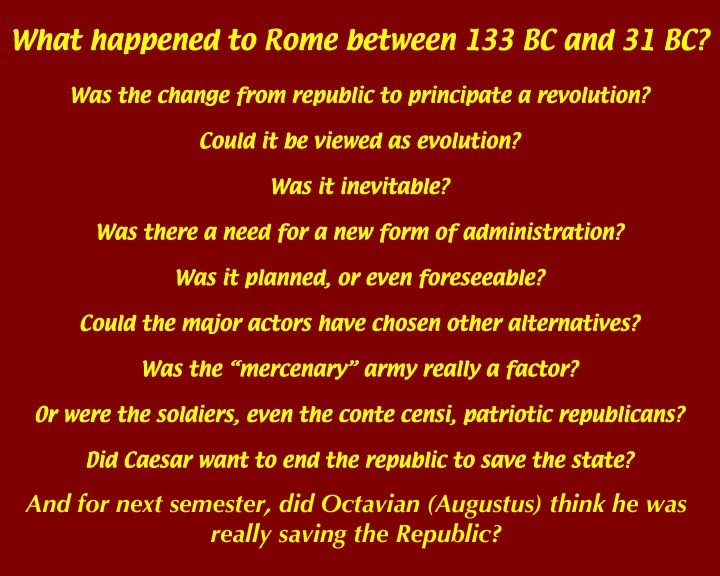 If you feel the need to go through the military history of the Civil War, a precis is at http://www.unrv.com/fall-republic/crossing-the-rubicon.php and on following pages (links at the bottoms of successive pages). 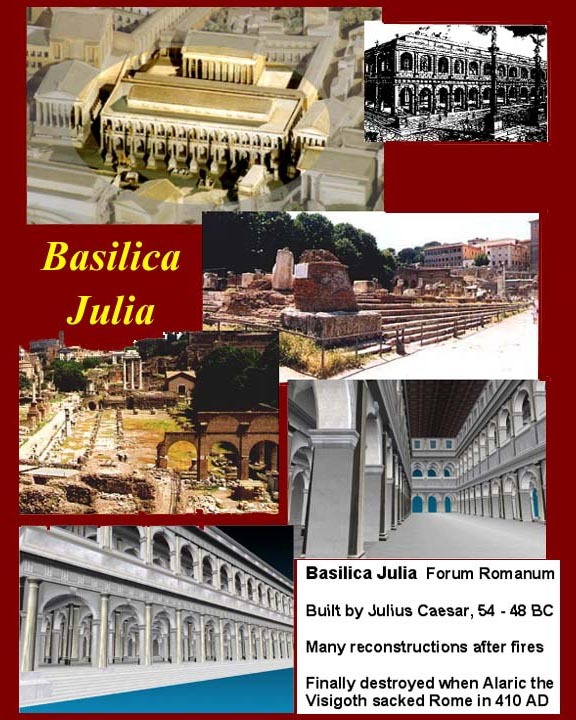 A good public domain translation into English of the De Bello Civili (along with the Gallic Wars) is available at http://etext.virginia.edu/toc/modeng/public/CaeComm.html. 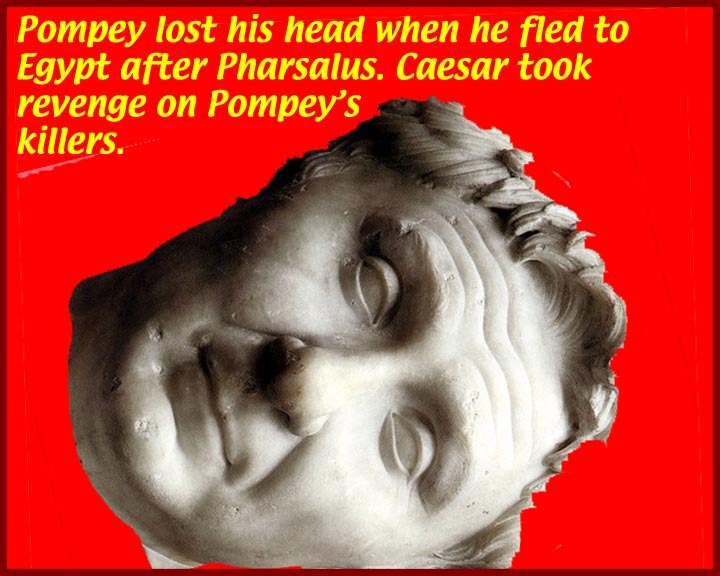 The Civil War ended with the defeat of Pompey at Pharsalis, but Pompey himself and cadres of his officers escaped. Pompey fled to Egypt where he hoped to raise a new force from among his former legionaries who were serving a mercenaries in the army of Ptolemy XIII. 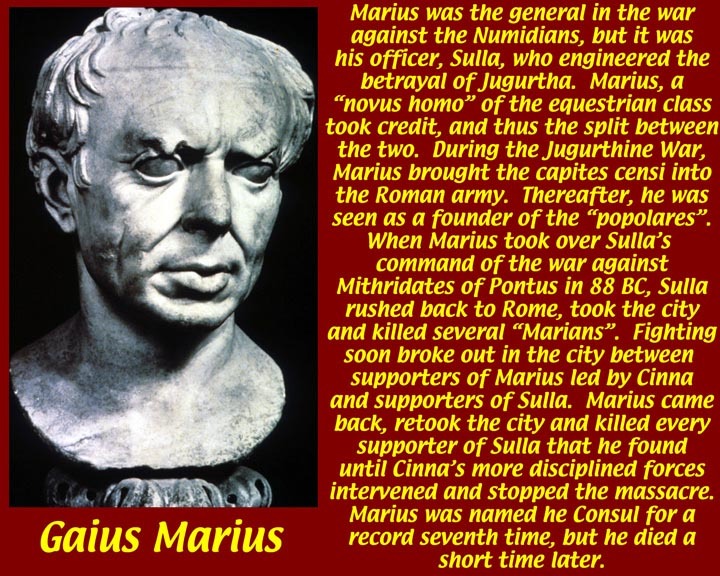 When he went ashore, those same mercenaries killed and beheaded Pompey on the orders of Ptolemy, who mistakenly thought Caesar would like the idea. 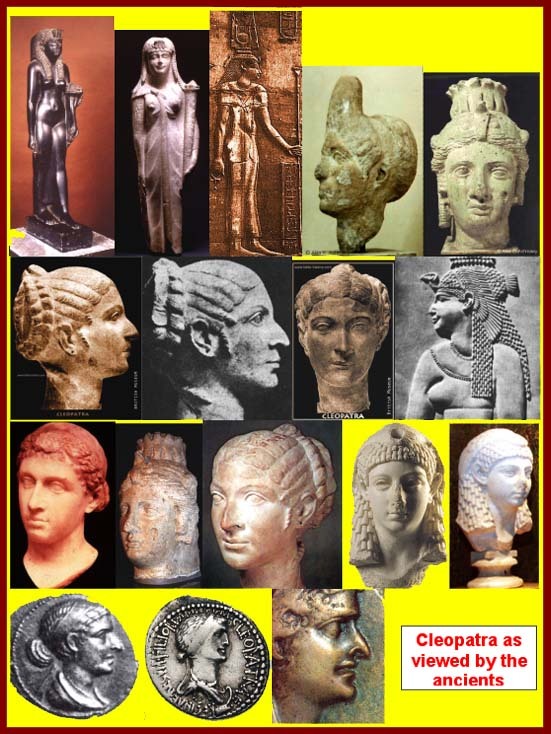 Caesar deposed Ptolemy XIII and put Cleopatra VII on the throne as sole ruler of Egypt..
Caesar stayed in Egypt long enough to have a son by Cleopatra and then headed home. 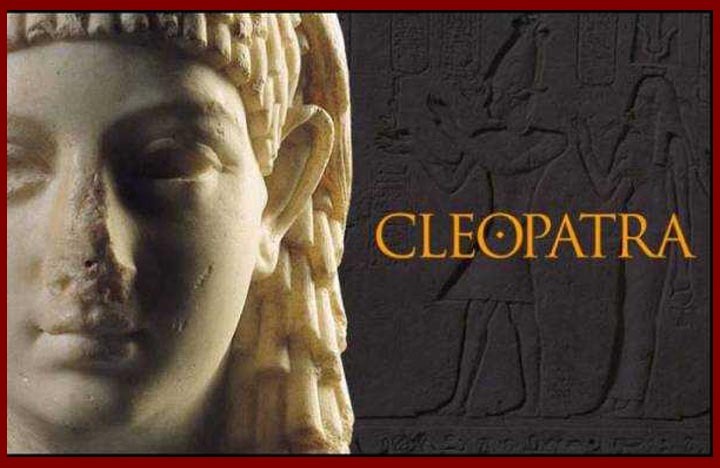 For more information than we can discuss in this class about Cleo, see http://en.wikipedia.org/wiki/Cleopatra_VII and http://touregypt.net/cleopatr.htm and http://ancienthistory.about.com/od/cleopatra/a/Cleopatra.htm, the last of which has many Internet links leading to more pages on Cleopatra. 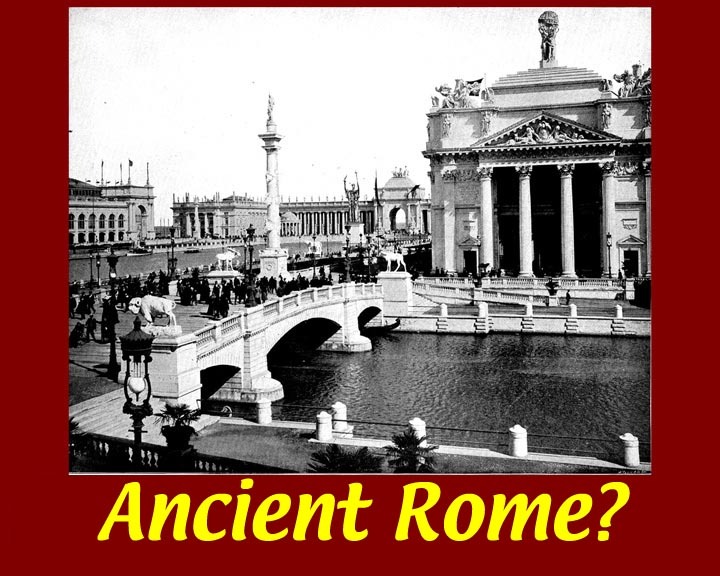 After finishing up in Egypt, Caesar returned to Rome via Bithynia. He then cleaned up remnant Pompey supporters in North Africa and Iberia. Sextus Pompey, Pompey's 6th escaped and became an important pirate who had to be dealt with during the Second Triumvirate. 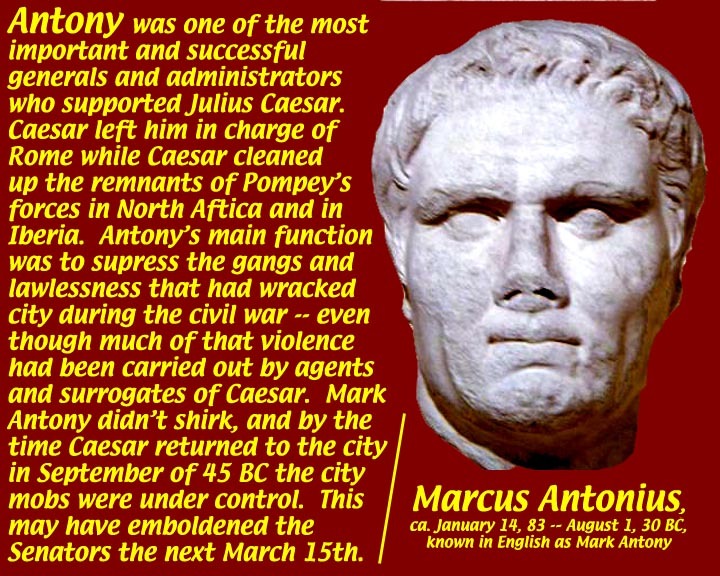 While Caesar was mopping up in North Africa and Spain, Mark Antony was left in Rome to bring the gangs and neighborhood mobs under control. By dint of being even more violent than they were, he succeeded admirably. 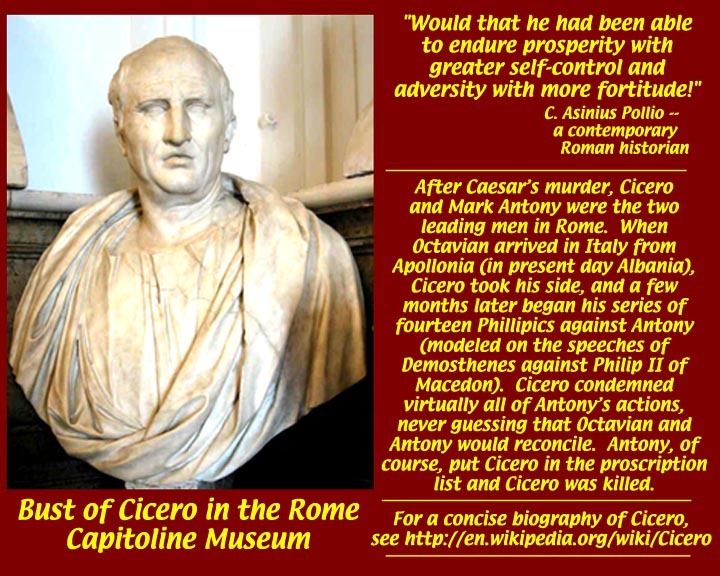 Antony was also left in charge of Caesars new government reforms and of his reconstruction and building projects. 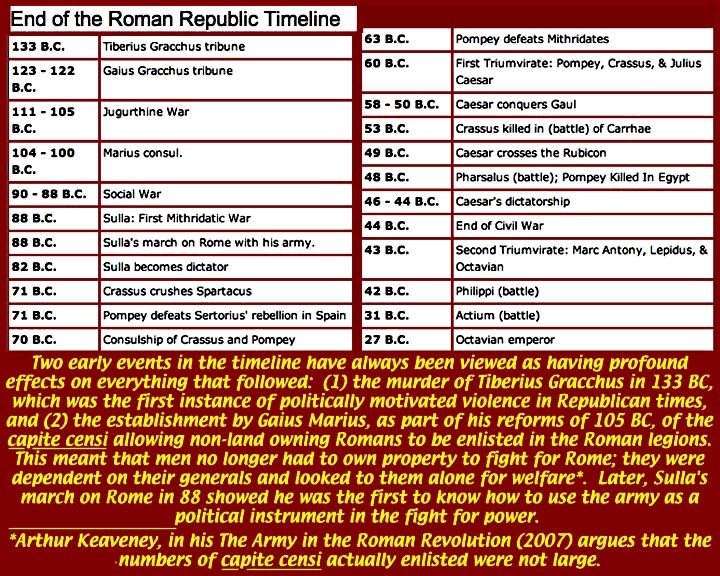 The Roman Republic is often said to have ended with the death of Caesar. His death did nothing to end the civil wars that had wracked Rome since the time of the Gracchi in the preceding century. 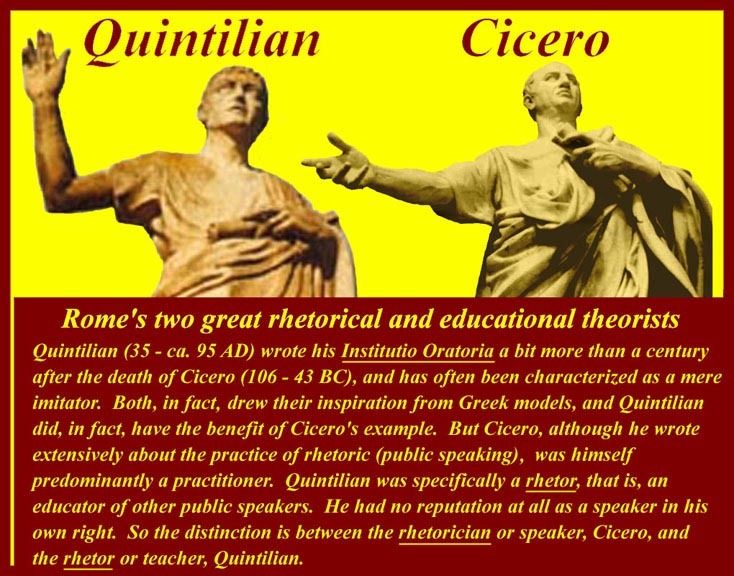 The beginning of the "Augustan Age", which established the Julio-Claudian dynasty of "Emperors" was just as violent as Octavian (Augustus) and Mark Antony cooperated to destroy the (Optimati) "Liberatori", who had killed Caesar, and the went after each other. 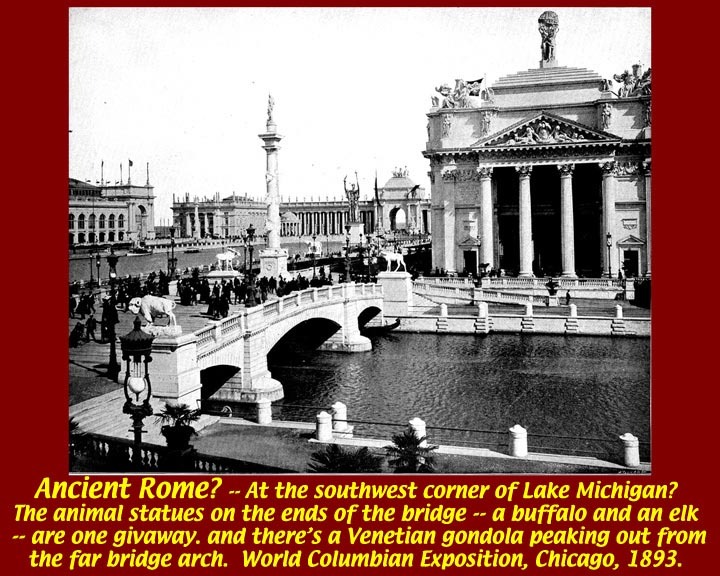 In what city could you find ancient Roman architecture mixed with statues of bison and elk and Venetian Gondolas? 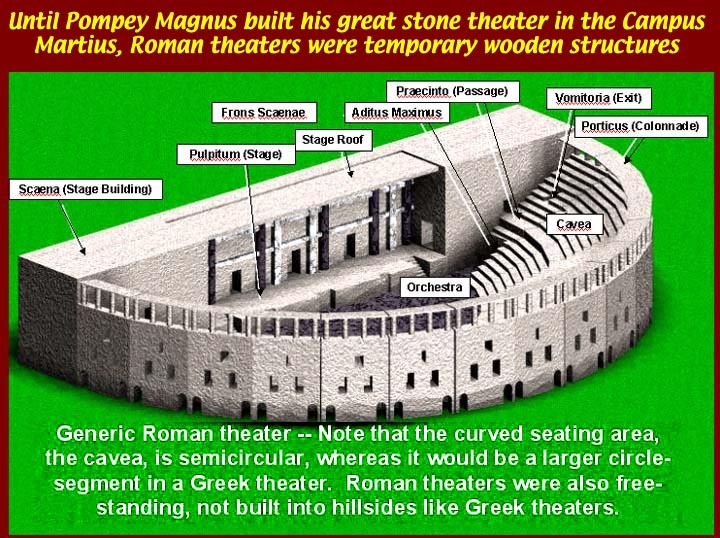 Could it be the same city where American football is played in a stadium that looked like the Circus Maximus and was named after the area where it stood, the Campus Martius? 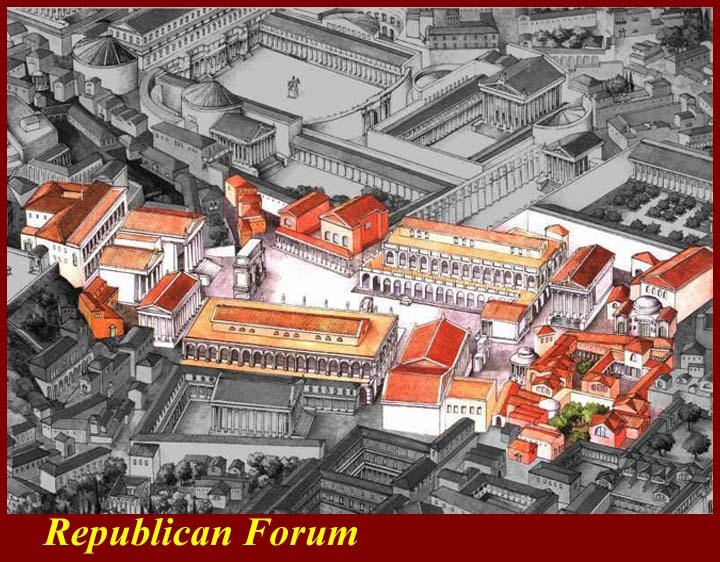 There's not much left that's Republican in Rome's Republican Forum. 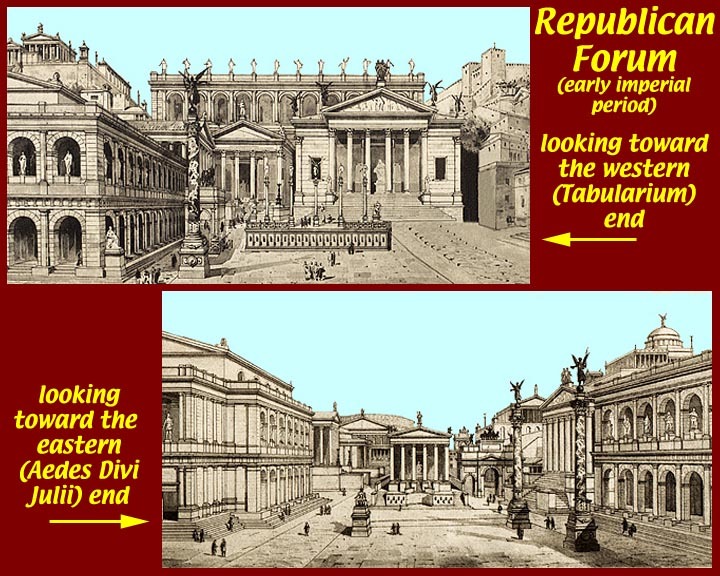 Augustus and later emperors felt the need to impress the people with bigger, better, more lavish versions of what was built during Republican times. 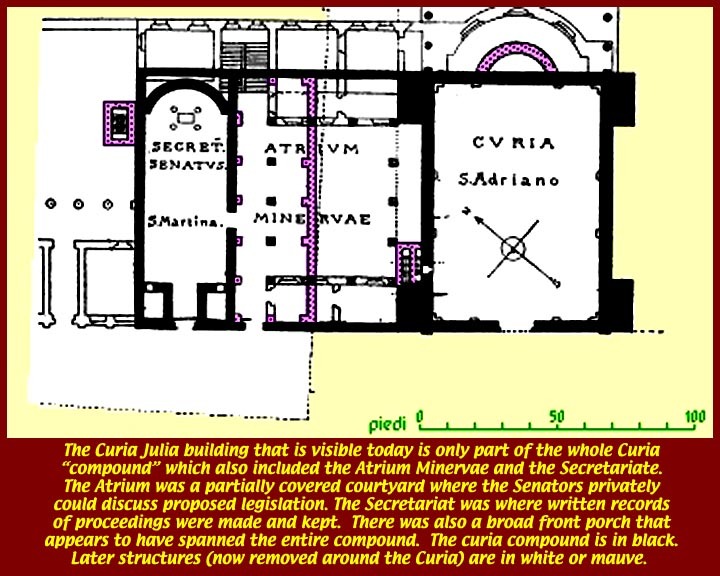 A few buildings retain plans that go back to the very late Republic (and especially some built by Julius Caesar), but even those were greatly embellished in later generations. Fires that swept through parts of the Republican Forum also contributed to the loss of earlier structures. 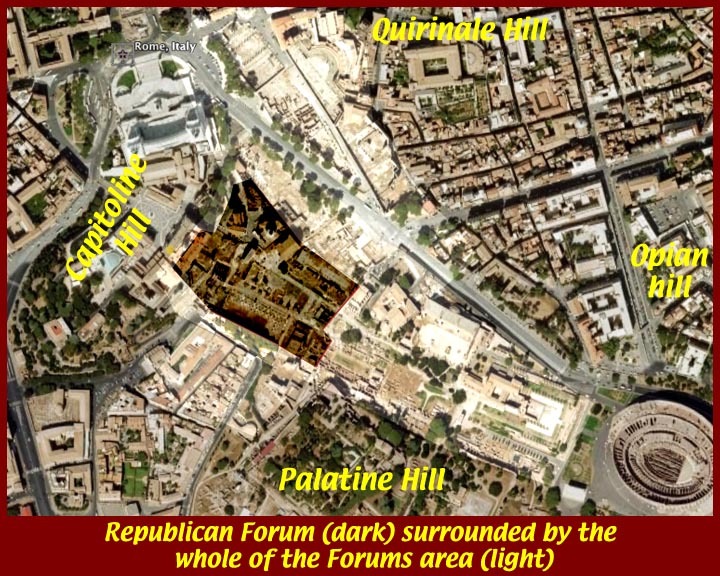 It is also important to note that the Republican Forum was, by the end of the Empire, only a small part of Rome's central forums. 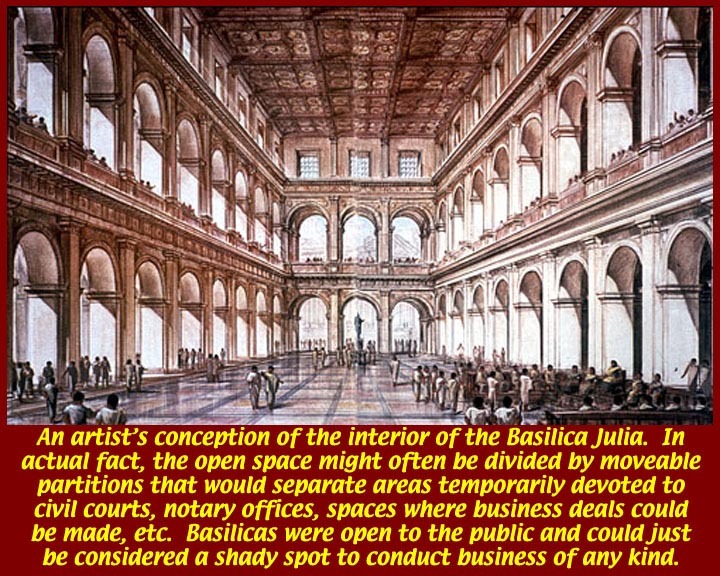 Basilicas were open to the public for juridical, commercial, or social activities. Sometimes sections would be separated by movable partitions, but only to cut noise crossover. 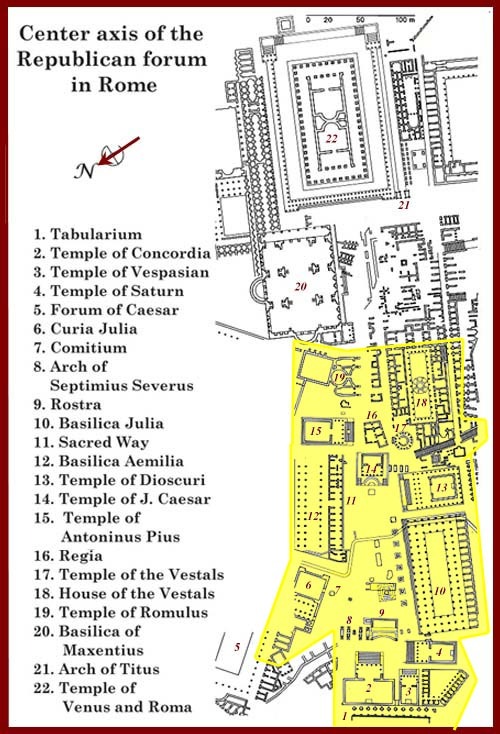 The defining characteristic of basilica architecture is a high wide central area flanked by (lower side area. Entrances could be through an end or ends or through either or both sides. The sometimes had an rounded apse, which could be centered in either a long or short side. Some had more than one apse. 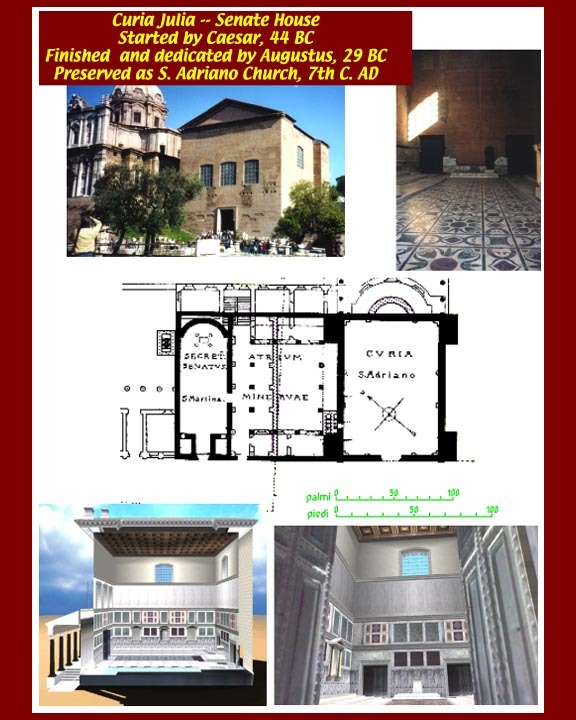 Later, mostly Christian basilicas could have a transept crossing at a right angle either at or near one end. 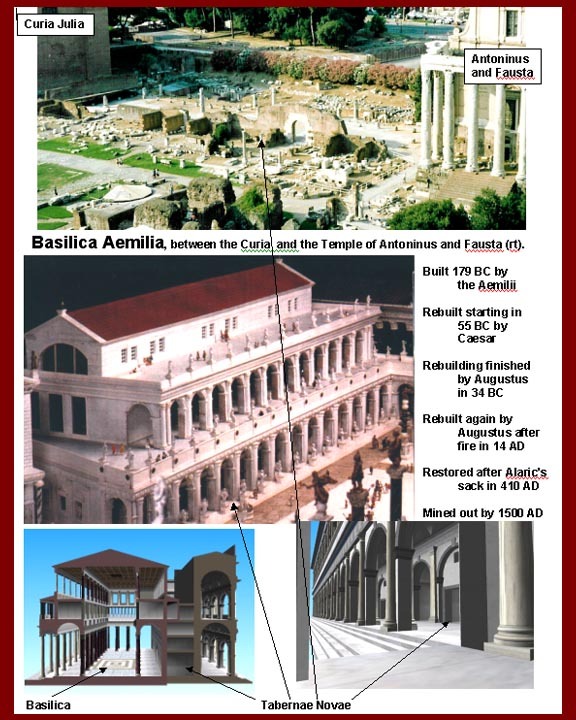 The two big basilicas in the Republican Forum, Basilica Aemilia built on the northern side of the Forum in 55 BC by Lucius Aemilius Paulus Lepidus and the Basilica Julia started on the southern side by Julius Caesar in 46 BC were both apparently financed by Caesar. at the time he was killed. It was finished by his posthumously adopted son and heir, Octavian. 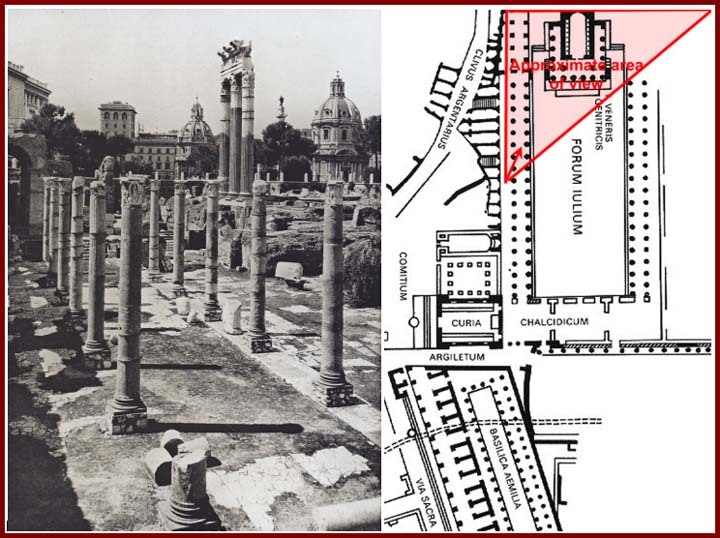 Caesar was killed at the Curia of Pompey which was at the back of the courtyard behind the scaena (stage area) of Pompey's Theater in the Campus Martius. 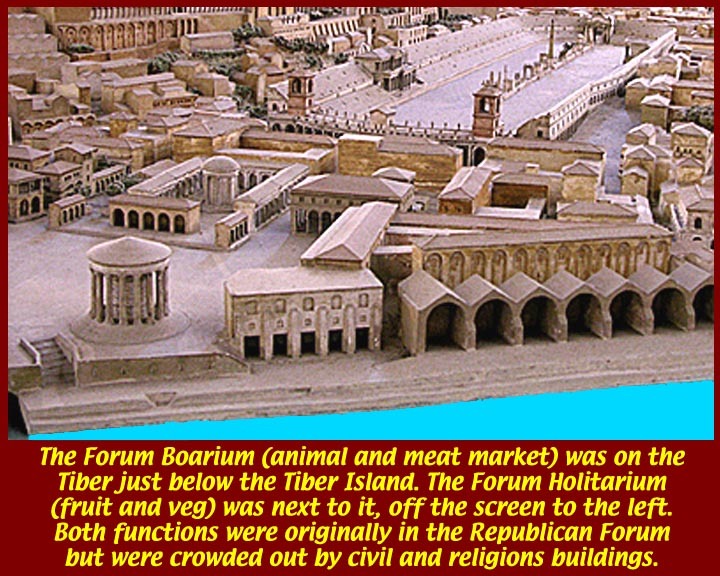 At the time he was murdered, Caesar was also building the first of what were to be known as the Imperial Forums. 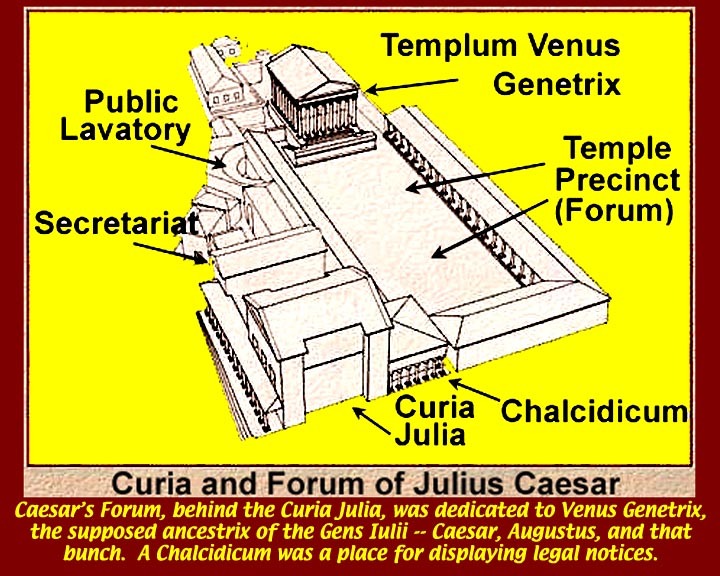 It could be entered either through the back doors of his new Curia or through an area known as the chalcidicum where public legal notices were posted. 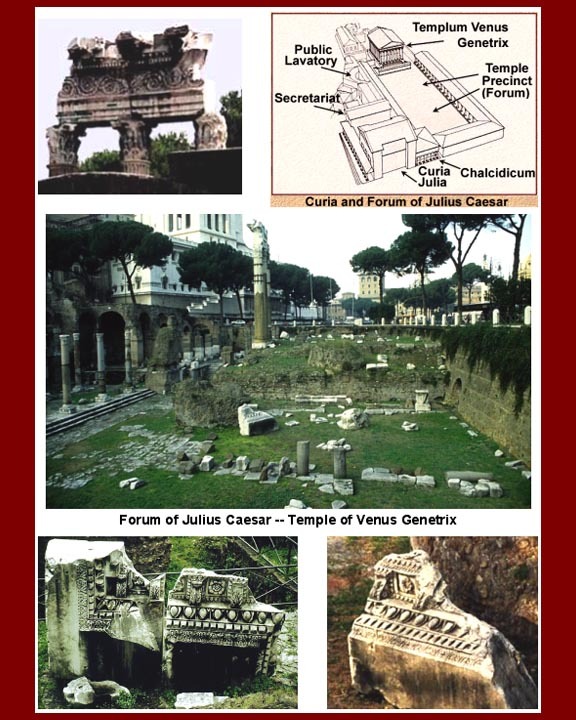 It's centerpiece was a large temple dedicated to Venus Genetrix, that is Venus in the guise of the mother of the Gens Iulii, Caesar's Julian family. 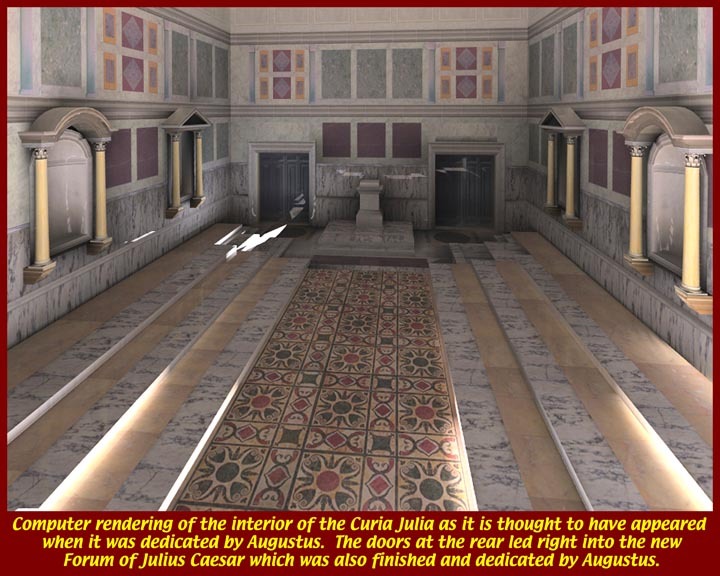 It was also completed by Octavian. 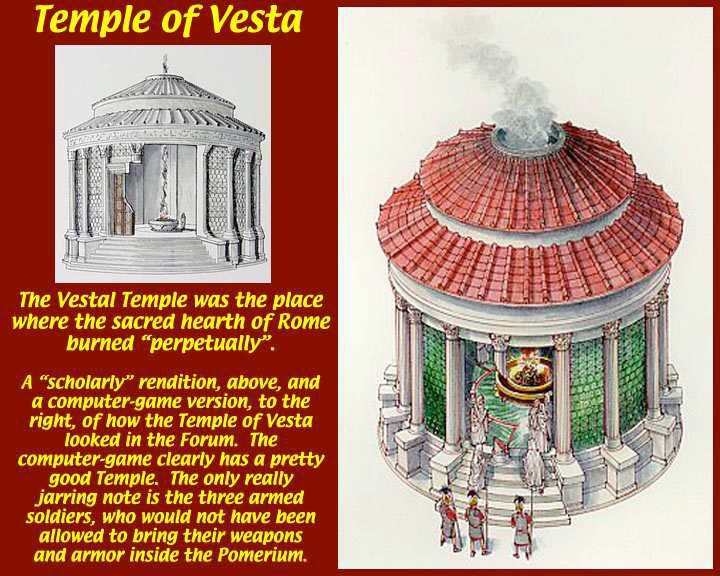 The Temple of Vesta was the cite of Rome's official hearth and the source of fire for all other hearths in Rome. It was the job of the Vestal Virgins, under the supervision of the Pontifex Maximus, to keep the flame lit -- if the flame was extinguished, the Romans believed, Rome was in dire danger. As mentioned above, the Temple burned many times, probably more often when it was wood and thatch than in later times when it was a stone structure. 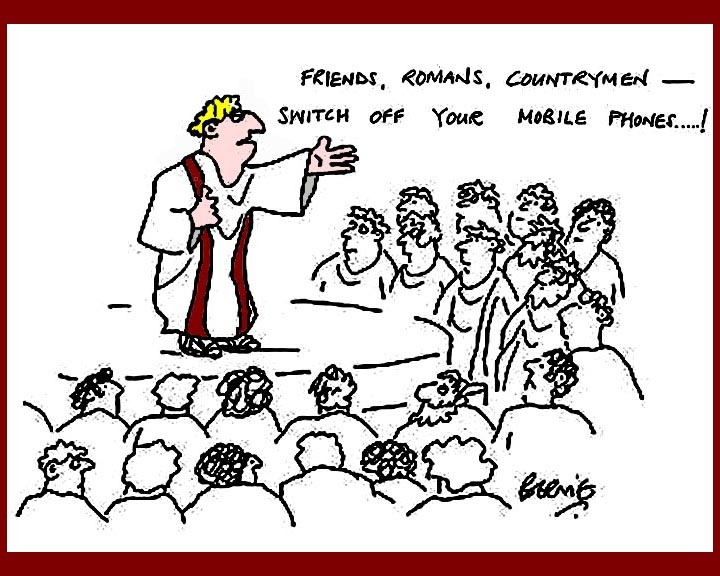 What stands today is thought to date from the 3rd century. 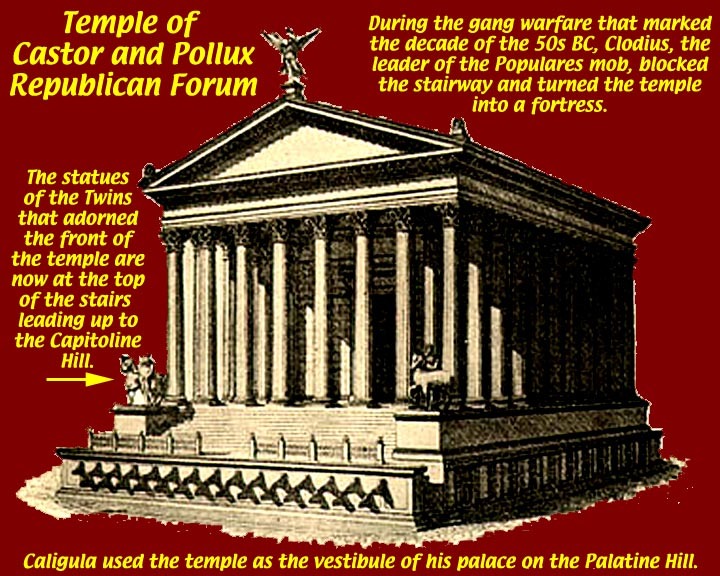 The temple was always round with an eastward facing door. In addition to harboring Vesta's flame, the temple was also the resting place of the Palladium, a statue of Athena supposedly brought from Troy by Aeneas. 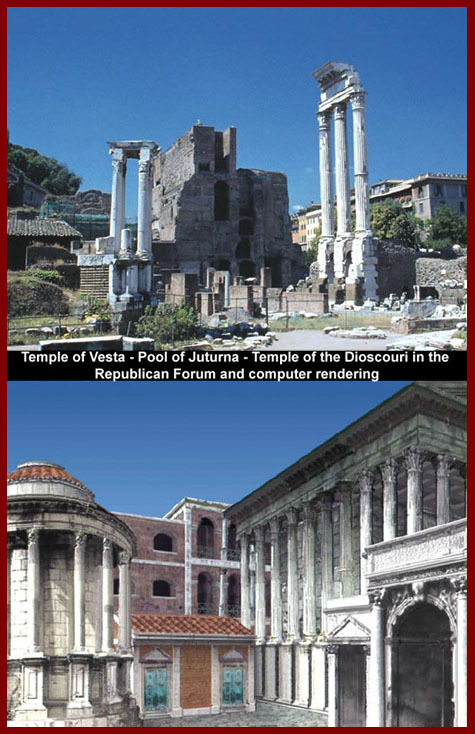 When Octavian (Augustus) moved from the traditional residence of the Pontifex Maximus to his new Palatine residence, he built an additional Temple of Vesta near his new home. An auxiliary duty of the Vestals was the keeping of wills of Roman citizens. 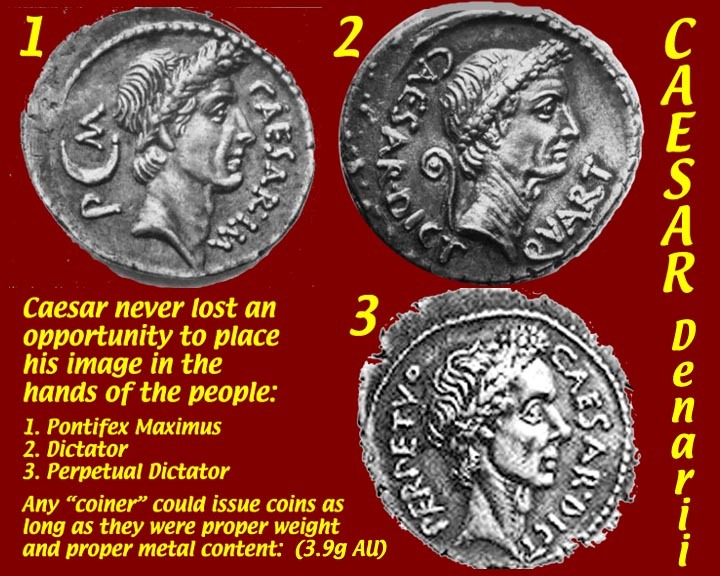 Caesar's will was in their hands when he died, and there has always been some suspicion that Octavian somehow slipped a false will in his favor into the vault. 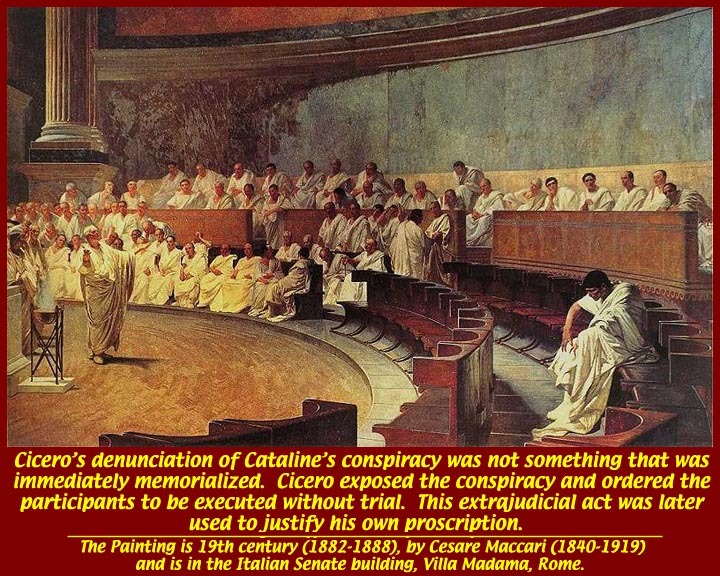 Later, during his propaganda war against Mark Antony, he was able to get his hands on and read to the Senate a supposed will of Antony, which would have left Roman eastern provinces to Cleopatra's children. famous eulogy (brilliantly paraphrased by Shakespeare from the rostrum in front of the temple. 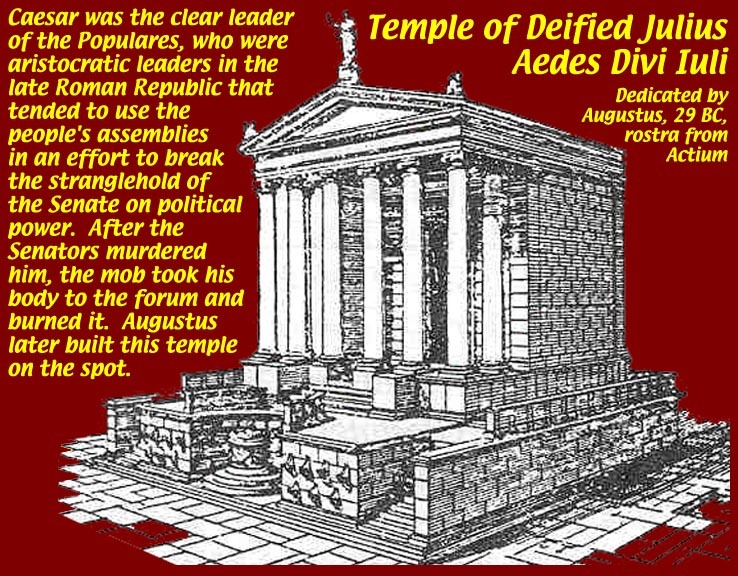 Caesar's pyre was built of wooden furniture from the temple, and on that spot was built the altar that stood in front of the nearby Temple of Deified Julius, which Octavian built, that closed the eastern end of the Republican Forum. In later years, Caligula broke through the Temple of Castor and Pollux to build a vestibule and stairway to his Palatine Hill residence. Finally the statues of Castor and Pollux that graced the pedestals on the sides of the temple pronoas were recovered in fragments and reassembled by Michelangelo. 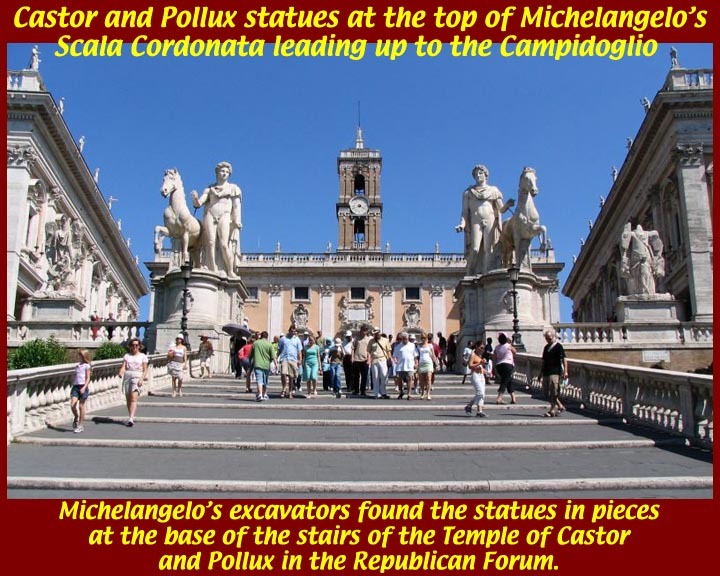 They now stand at the top of his scala cordonata leading up to the western side of the Capitoline Hill (Campidoglio). 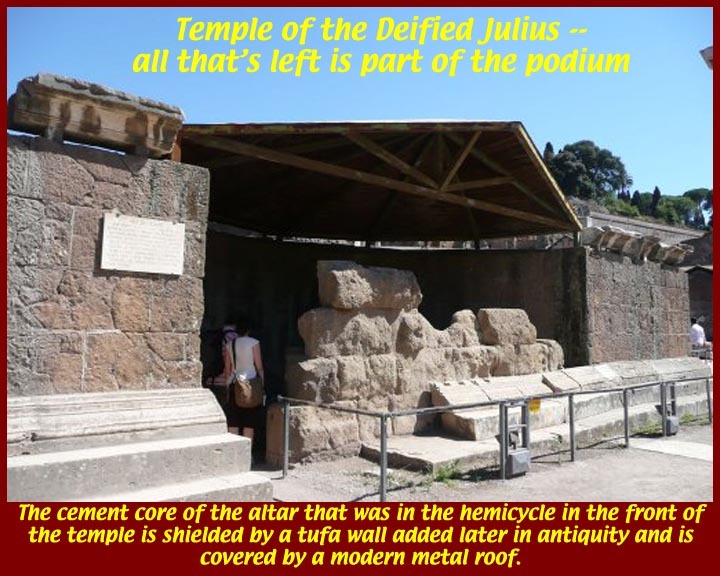 The Temple of Deified Julius (Aedes Divi Iuli) stands at a right angle to the Castor and Pollux temple. 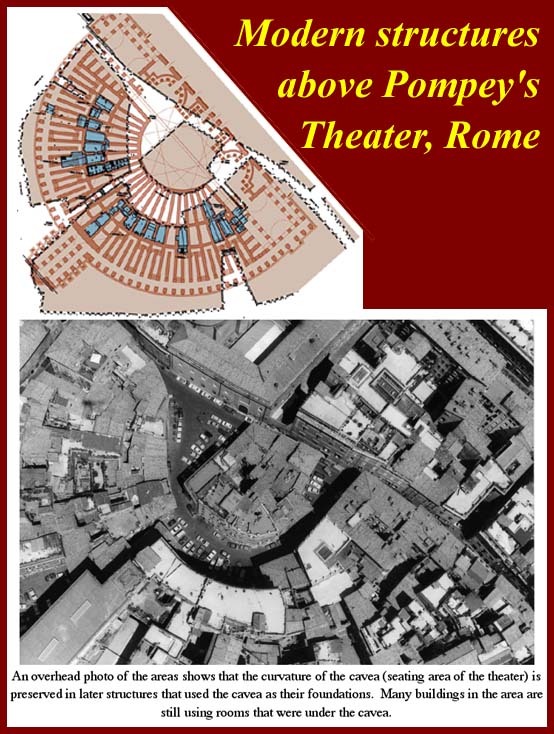 The images show its configuration and the site of the altar built at the site of Caesar's impromptu pyre. 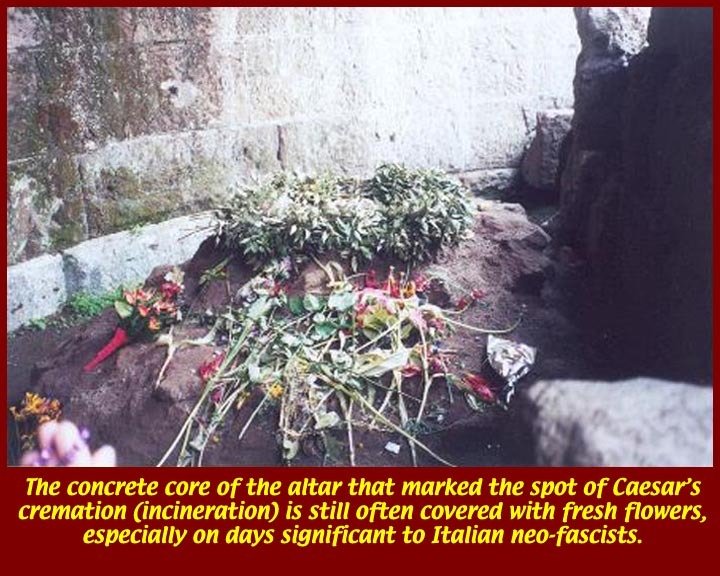 The ancient Roman concrete core of the altar still has fresh flowers on it almost daily, especially on neo-Fascist feste. 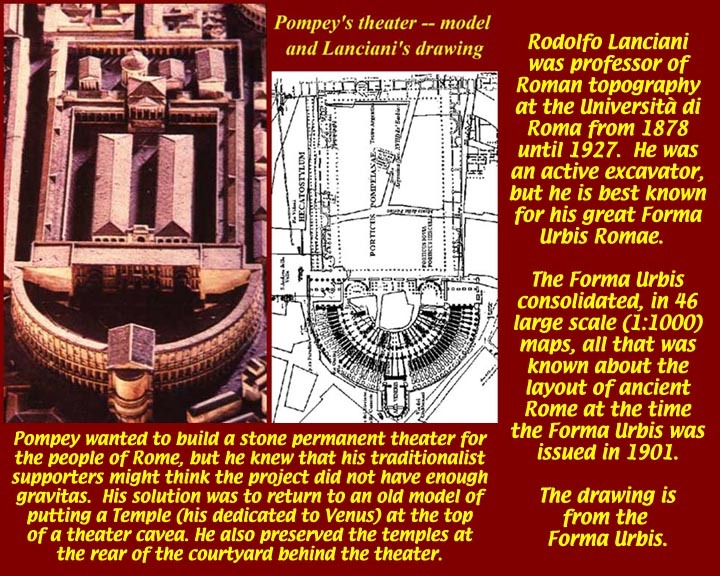 in the area and what is said to be part of the Venus Temple is in the upper floors of a one-star (two at a stretch) hotel. It's in the right place and it looks like it might be part of a temple. 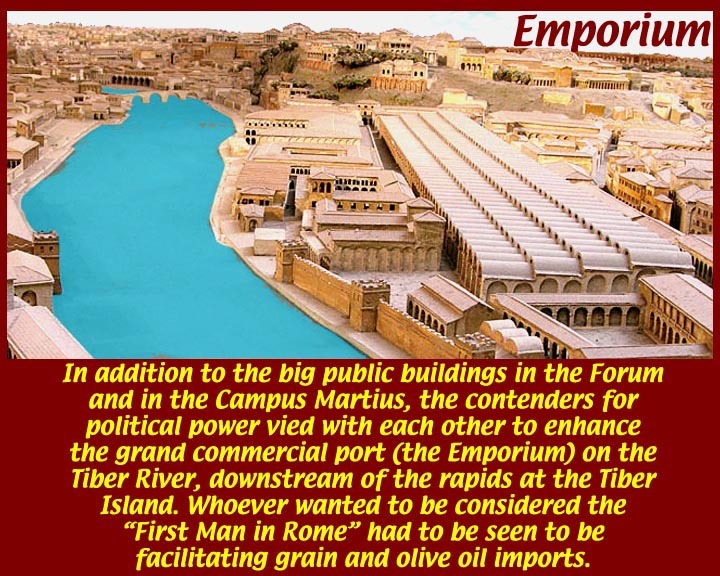 Rome's import infrastructure was sometimes seriously neglected during this period, although the grain merchants tried to keep open the port of Rome below the Tiber Island. 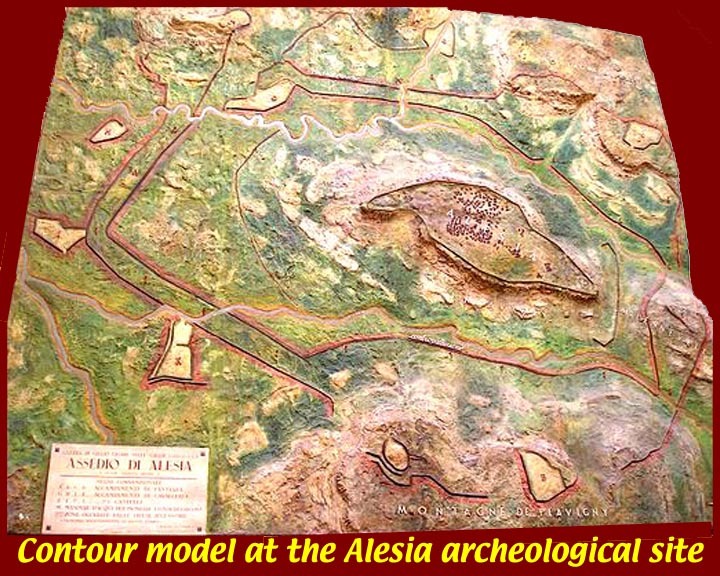 The illustrations show the great warehouses that eventually filled the port area and are from models of later periods. Pompey's efforts against the pirates were designed to keep the warehouses full of grain. The other major import was olive oil from Iberia. 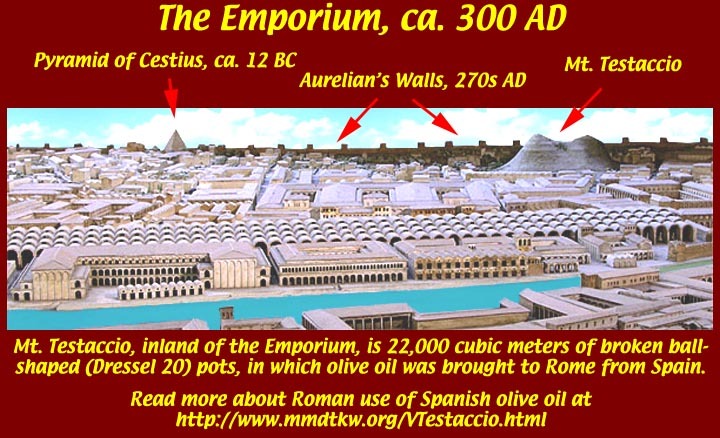 Spain still provides more than 40 percent of the world's olive oil, and Italy still uses more than 30 percent. Although Italy is the world's second largest producer of olive oil (about 30%), and it exports some fine oils, it is a net importer of olive oil because it is also by far the world's largest consumer. I recommend the Italian Bertolli "Rich Taste" oil, which, as close as I can tell, is the same as the Bertolli "Robusto" that is sold in Italy -- but then I do prefer to taste and smell the olives in my oil. (I'm neither an employee of nor an agent for Bertolli -- just a big consumer. ).